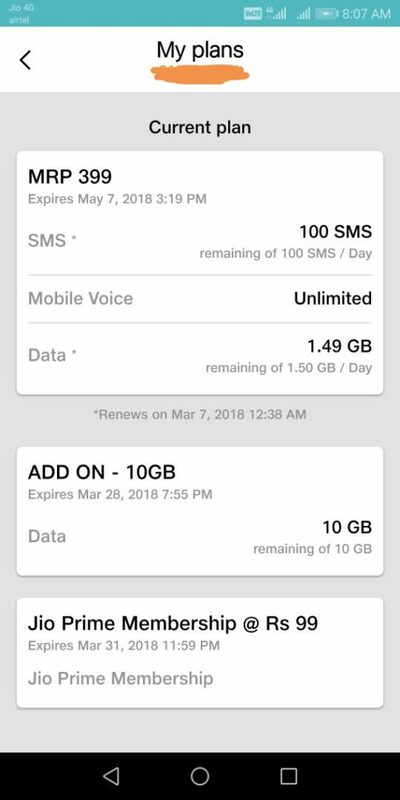 Reliance Jio is now offering additional 10 GB data balance on Jio and the additional benefit is available till 30 March 2018, which is a day before when Jio’s timeline for Prime subscription ends. Though this 10GB free data add-on is a great offer from Reliance Jio, it is not applicable to all users. Those who haven’t received the free data can dial the toll-free number 1299 to get 10GB data for free and enjoy using it until March 27 without any concerns of exhausting the daily limit. Do dial this number from your Jio number and let us know if you have received the free add-on pack. The data balance can be checked from the MyJio app. Open the MyJio app on your smartphone and go to the My Plans section from the menu. Over here, you can see the 10GB data add-on. Once you start using the free data, you can see the balance from the MyJio app itself.